TradingView - [OCO] Bracket Orders Now Available for Live Trading!!! 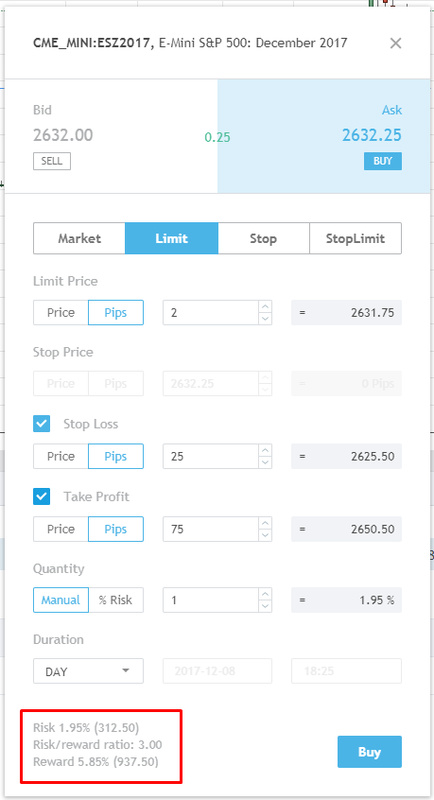 TRADINGVIEW ADDED STOP LOSS AND TAKE PROFIT ORDERS TO AMP/CQG FOR LIVE TRADING! TradingView uses the latest HTML5 chart technology cloud-based setup works on any modern device, such as iPads, iPhones, and Android/Windows/Linux phones, tablets and computers. *FREE for AMP Customers –No Monthly Platform Fees – No Extra Per Contract Fees! You are now able to add bracket orders (stop loss and take profit) to your orders and positions. They can be added when creating an order or at a later stage by editing the existing order. You can add SL and TP orders using an order dialog window just like before. Risk, reward and risk/reward ratio is calculated when creating a stop loss and take profit order. We’ve created 2 modes. Switch between them by ticking the Brackets Management box. When Brackets Management box is ticked, SL and TP orders are modified automatically. Here is what gets modified. Bracket orders are automatically cancelled if the position is closed or reversed. Bracket orders are automatically modified when the quantity of the main position changes. Older bracket orders are automatically cancelled. Quantities in new bracket orders are automatically adjusted. Here is how it works: Let’s assume that we have a position with bracket orders. An order with SL and TP gets executed. The old bracket orders are cancelled and the quantity in new SL and TP orders is adjusted according to the quantity in the position itself. Important! 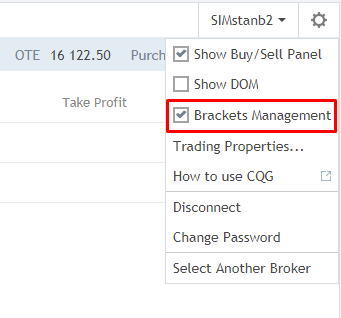 Your browser tab needs to be opened and you need to have a live connection to the CQG broker in order to manage the bracket orders. When Brackets Management box is unticked each trade can have its own TP and SL orders. Bear in mind that they’d have to be managed manually. We’ve added notifications for the sake of convenience. Keep an eye on them since they help you stay informed of the recent changes. 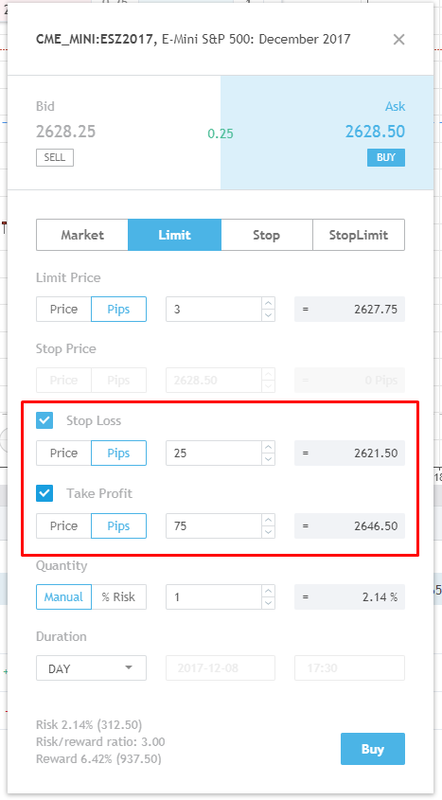 It’s worth mentioning that if a position has several SL and TP orders (This can be done through another platform or TradingView when Brackets Management box is unticked) then ticking the box won’t change the orders. They won’t be cancelled or grouped together. However, bracket management will be turned off for a symbol that has such position until only 1 pair of SL and TP orders is left. Our notifications will inform you about this. 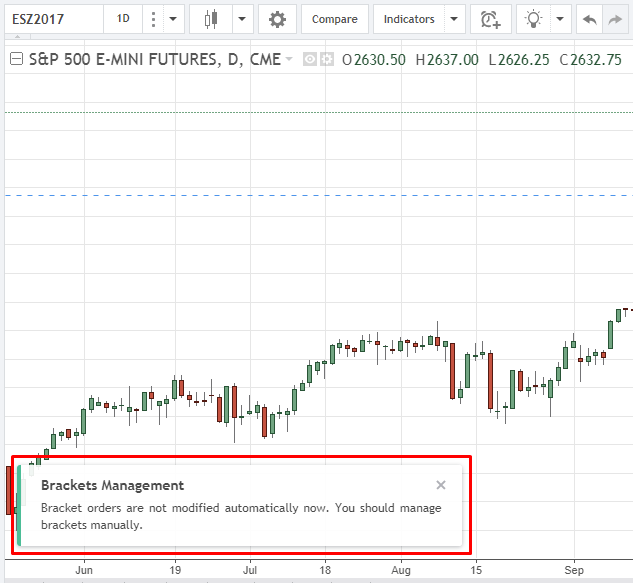 Please also note that if Brackets Management is on and if there is a position with SL and TP orders and user places a bracket order that gets executed, then SL and TP correction (cancellation of old ones / modification of new ones) will only happen in the event that price is at least 10 ticks away from all orders. You should be informed about this through our notifications as well.